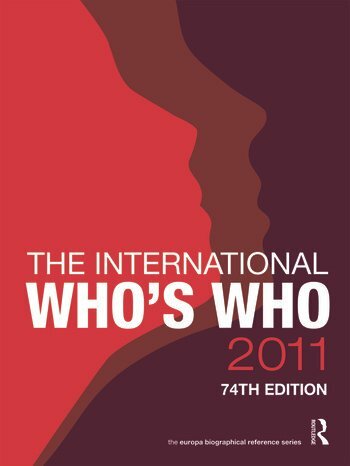 Published annually since 1935, The International Who’s Who is now in its seventy-fourth edition. Providing hard-to-find biographical details for over 24,000 of the world’s most prominent and influential personalities, this outstanding reference work records the lives and achievements of men and women from almost every profession and activity--from heads of state to sporting greats. The editorial team aims to include all those who have risen to the top of their field or profession--from the headline makers to the unsung experts whose achievements and talents guarantee their inclusion. Entries are taken from across the world and from a broad sweep of professions, to include the leading figures from the worlds of science, medicine, business, finance, politics, international affairs, diplomacy, law, art, music, entertainment and fashion, to name but a few. There is also a separate section that details reigning royal families.